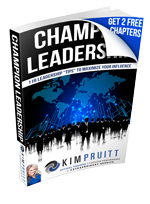 Sign up for our mailing list and receive the first 2 chapters of “Champion Leadership” as our gift to you! Everyone claims they want extraordinary results but very few people are willing to do what it takes to achieve that. The principles to winning in both sports and business are the same. It takes mental toughness, focus, clarity and a committed conviction to do what needs to be done all the time, every time. It’s not easy but it can be done. As anyone who achieves a very high level of success will tell you, your climb to the top will need someone else. Someone who will jump ahead of you to cheer you on when the climb seems steep and get behind you to push you. Someone who knows you are capable of great things and has the skill to pull that out of you. Someone who understands the highs and lows of the path you’re on because they have been on it themselves. After working with hundreds of leaders in both sports and business, I know that certain things must be put into place to achieve optimal results. When you integrate my “Champion Method™” into your daily routine, you’ll get where you want to be, faster than you thought possible. What is the Champion Method™? haracter – what you do will never matter as much as who you are. ard Work & Hunger – you must have the discipline to do what needs to be done, the desire to do it consistently and a daily agenda set to make sure it happens. ccountability – it’s only when you keep your word to yourself and to others that great things start to occur. indset – You must let go of limiting beliefs and reprogram your subconscious to believe differently before you can do differently. ersonal Development – Investing in yourself to discover your unique strengths and gifts will help you solidify your intentionality and ensure your rise to greatness. mplementation – knowledge without action is just information. When you take action, you claim your spot in the world. ptimize – every situation presents an opportunity to either expand or contract. Flexibility, reflection and resiliency are key components for success. ever Give Up then Navigate the way for others – the victor is the one who perseveres no matter what and a Leader is always blazing a trail; not just for himself/herself but for others as well.